Sponsored by the National AfterSchool Association, this issue is dedicated to the essential importance of learning and development in the nonschool hours and the need for a community commitment to support and fund these opportunities on behalf of youth today and community leadership in the future. Rethinking out-of-school learning opportunities in ways that better meet the developmental needs of early adolescents, the editors utilize their own recent experiences creating and leading a statewide effort to support community-based and school-linked nonformal learning opportunities for youth. Themes of intentionality, quality, engagement, and youth voice are illustrated with clear lessons learned in the field. The critical issue of the community role and responsibility to provide these opportunities for our nation's youth is fully illuminated. From how to frame an understanding of their experiences to increasing intentionality in their design, the contributors to this issue explore and young people's journeys into community during their non-school hours. This is the 112th volume of the Jossey-Bass quarterly report series New Directions for Youth Development. Dale A. Blyth is the associate dean for youth development at the University of Minnesota, where he directs the Center for 4-H and Community Youth Development and provides statewide leadership for the youth development program area of the University of Minnesota Extension Service. Joyce A. Walker is a professor and community youth development educator at the Center for 4-H and Community Youth Development at the University of Minnesota, where she also gives leadership to the Youth Development Leadership M.Ed. Program in the College of Education and Human Development. Editors’ Notes (Dale A. Blyth, Joyce A. Walker). 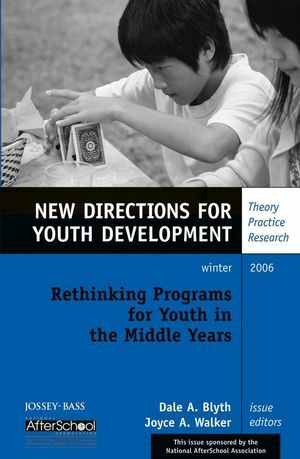 Strategic frame analysis suggests new language and messages to advance the public understanding of the importance and role of quality programs to promote learning and development for youth in the middle years beyond what it is today. A diet-and-exercise analogy is proposed to more clearly elucidate the significance of learning and development and the synergistic role that adults and young people play in youth development programs in the after-school and out-of-school time. Young teens and their parents offer complex and often idiosyncratic reasons and insights into why they do or do not participate in structured activities. Young people are the marketing experts when it comes to understanding how to increase interest in and demand for youth programs and other learning opportunities to young teens. This theoretical framework suggests that young people such as those in the middle years are more likely to achieve developmental outcomes in out-ofschool programs if these programs deliberately build on the essential elements of intentionality, engagement, and goodness of fit. A research-based construct of youth program quality is presented that differentiates safety, support, interaction, and engagement, four important issues for practitioners working with youth in the middle years. Youth practitioners face a wide range of dilemmas in their daily work, and they must be able to react intelligently in difficult situations when competing objectives, values, and warrants come into conflict.